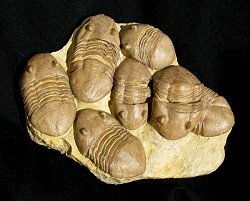 This is a fabulous multiple plate of classic US trilobites. This is a plate of Homotelus bromidensis from the Ordovician of Oklahoma. This specimen was recently acquired from an old fossil collection. There are SIX complete specimens and one partially obscured example of Homotelus on the slab. The trilobites are 3-dimensionally preserved and exhibit very fine detail. The protruding eyes are easily seen, and the individual thoracic segments are clearly defined. The bugs have outstanding color and contrast and are NATURALLY positioned on the beautiful plate of limestone. This is a phenominal display specimen showing both the gregarious nature of trilobites and the impressiveness of death assemblage plates.